I LOVE these if I say so myself. You simply make my Olive Tapenade recipe then pop it in a sieve, over a bowl for a few hours to drain the extra juices. While the tapenade is draining make my Basic Pizza Dough recipe. #Both recipes can be found using the “Search” button on the top right hand corner of my “Home” page. You also need nutritional yeast (which you get at your local health food stores.) This is what makes your scrolls “cheesy”. I used 1-2 cups. Using a butter knife, evenly spread the olive tapenade onto your dough rectangle, being sure not to cut the dough and spread right to the edges of your rectangle. Sprinkle a cup of nutritional yeast evenly over the rectangle. Evenly slice roll and place onto a large (baking paper lined) tray…..cut side up. 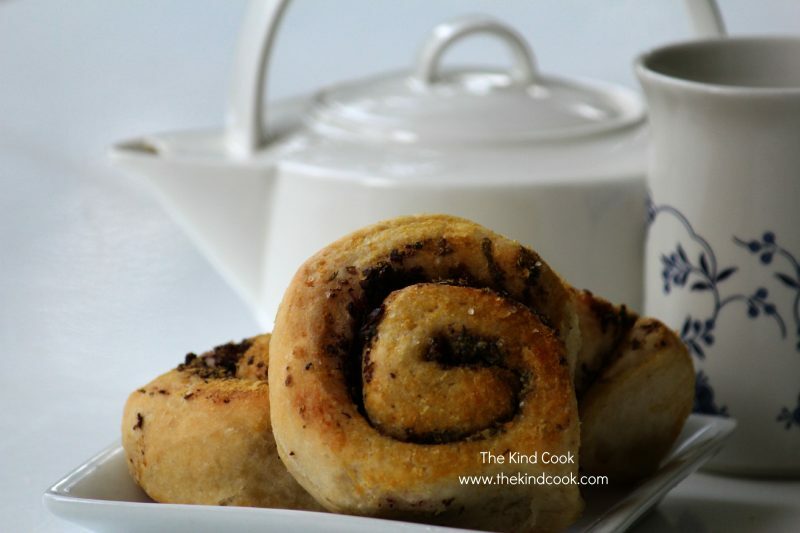 Brush generously with oil and sprinkle more nutritional yeast over the top of the scrolls. I also then seasoned with some salt. Allow the scrolls to proof. You want them double in size. Place into a preheated oven at 200c for approx 20 minutes. Cooking time will depend on the strength of your oven and size of your scrolls. Once cooked, remove and cool on cooling rack. Yields: This made 18 scrolls. Alternatively, you could obviously cut much larger scrolls or much smaller scrolls. Freeze: I prefer to eat recipes like this fresh so I haven’t tried freezing this one. You can certainly freeze the pizza dough though and just let it that which makes for a much quicker cheesy olive scroll recipe. Notes: #Try not to get intimidated by what seems to be a long recipe. In essence you are simply making some bread dough and a tapenade..both of which are EASYYYYY.